A family picnic in the 1950s, at the family homestead, Tower, Michigan, including the family matriarch Mary (Peltier) Bernia. Growing up in Northern Michigan was in every sense, a primer of French-Canadian heritage. My father was full-blooded French-Canadian, having family only two generations removed from himself, who were immigrants from Canada. I know from early conversations with his mother, my Grandma LaForest, that he could only speak French when he learned to talk, because his grandmother, my Great-Grandma Bernia was so instrumental in teaching him to speak. Of course, Grandma Bernia’s first language was also French, having been a child of French-Canadian immigrants herself and I presume that she was fluent in French as well, though my conversations with her were always in English. Both Grandma LaForest and Grandma Bernia were active in maintaining my French-Canadian roots either directly, through storytelling or indirectly through maintaining customs such as serving traditional foods at holidays or in the way everyday foods were cooked. My mother along with my father’s three sisters, were all very instrumental in perpetuating those traditions. Chicken and glisants were often served for Sunday meals at our house, the family homestead for nearly one hundred years. My mother was the product of a German-Irish family from South Dakota, but seemed to relish in her forte as a cook in the traditions of our French heritage. My mother recently passed on, but the memories of her Sunday dinners, which in and of themselves were traditional, will live on in my memories as long as I am able to attempt replication of those meals. Sunday afternoon meals, as a kid, were always somewhat reminiscent of holiday meals; always had structure and were always big. 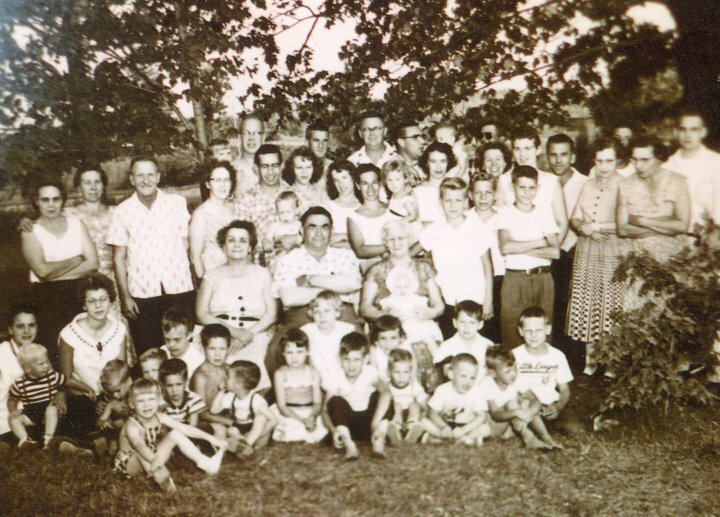 At one time, there were ten of us (our parents and eight children) living on the family farm. Dinners needed structure to circumscribe chaos, and were always served family style around a huge table in the big, square dining room of our farmhouse. My father, hunter and gatherer that he was, also did his best to maintain tradition and adherence to his French-Canadian ways, by passing on his apt abilities of hunting, fishing and gathering wild food to me and my seven siblings. I learned from an early age how to use and maintain tools of the woods – guns, knives, walking sticks and a compass. It was just a normal way of growing up, as kids in Northern Michigan, to traverse and learn every square inch of the forty acre family farm as well as the surrounding forests, for miles in every direction. At the age of fourteen, when we could legally hunt for deer, we already knew how to accurately use the tools of survival in the wilds and were quite confident with our abilities to go into the woods with only a jack-knife and stay for a day or two, living off what we could find or catch. I never had the experience of meeting my father’s father, who passed on his woodland prowess to my dad, but have learned from many people that he was an exceptional human being and had a profound respect for nature. His life was hard and he died young, much like many people of his generation, but he left a legacy of French culture and distinct memories of how well adapted he was to his natural surroundings. His blood courses through my veins, as it does my siblings and my cousins every one of whom adheres to some French-Canadian traditions. My cousins are as much a part of my life as my siblings are and I relish every meeting I have with them, however brief those meetings may be nowadays. I suppose cherishing our family is part of the tradition that has been passed down to us for several generations – when our ancestors first came to the Great Lakes then traversed through the wilderness of Canada and Michigan, our homeland.